This is a comprehensive curriculum that can be used as your core math unit or as a supplement to a district curriculum. 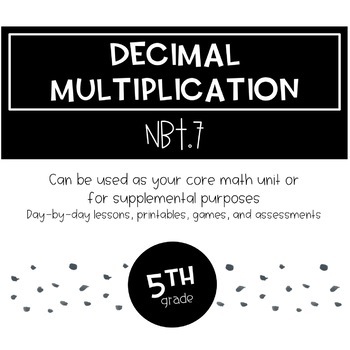 There are warm-ups that are related to decimals to get your students engaged and thinking, mini-lessons that teach effective models for multiplying decimals, independent or partner practice pages that are related to the mini-lesson, math center rotation guide, engaging math games, and 2 summative assessments! EVERYTHING YOU NEED to teach your students how to multiply decimals well! The unit includes 2 SUMMATIVE ASSESSMENTS, but you can use the independent practice for formative assessments. We hope you find these units to be very effective for your students!